SpaceX Falcon 9 launch of SES-10 on March 30, 2017. Credit: SpaceX. Yesterday in the Globe and Mail, Micheal Byers floated the idea that SpaceX “needs a spaceport in Canada” to launch a constellation of several thousand small satellites for SpaceX. It’s wishful thinking, it won’t happen and here’s why. SpaceX currently has two active launch pads. One in Florida at NASA’s Kennedy Space Center, and the other at Vandenberg Air Force Base. Another launch pad at Cape Canaveral Air Force Station next to Kennedy Space Center, was damaged in an explosion last September but is expected to be operational again by August. SpaceX also has under development their own private launch complex just east of Browsville, Texas in Boca Chica on the Gulf of Mexico. That’s a total of four launch pads in three states. On September 22, 2014 SpaceX broke ground on land in Boca Chica, Texas for their private launch facility which is scheduled to come online sometime in 2018. When the new launch facility is online SpaceX will be able to conduct an initial 12 launches per year from the site without some of the restrictions placed on them at their government leased locations. Eventually the facility will scale up as their primary commercial location. There may also be the possibility for additional launch pads. Construction in the surrounding area to support the launch facility is ongoing, and reportedly on schedule. SpaceX also has a testing facility in McGregor, Texas. Combined with their fabrication plant in Southern California, it all works nicely logistically. SpaceX is in the initial stages of developing a small satellite constellation for Low Earth Orbit. In documents filled with the FCC the total number of satellites they are proposing to deploy is 4,425 of which 1,600 would be part of an initial deployment. That’s a staggering number of satellites and has never been attempted before. As the chart below shows, SpaceX will also be launching the satellites at different inclinations, meaning they can presumably launch from all their launch facilities. Source: FCC document submitted by SpaceX. SpaceX will need to launch as many satellites as possible per launch for its initial 1,600 deployment. Each satellite will weigh 386 kg, pretty lightweight for satellites. SpaceX has already shown it can launch 10 satellite per launch for the Iridium Next constellation. 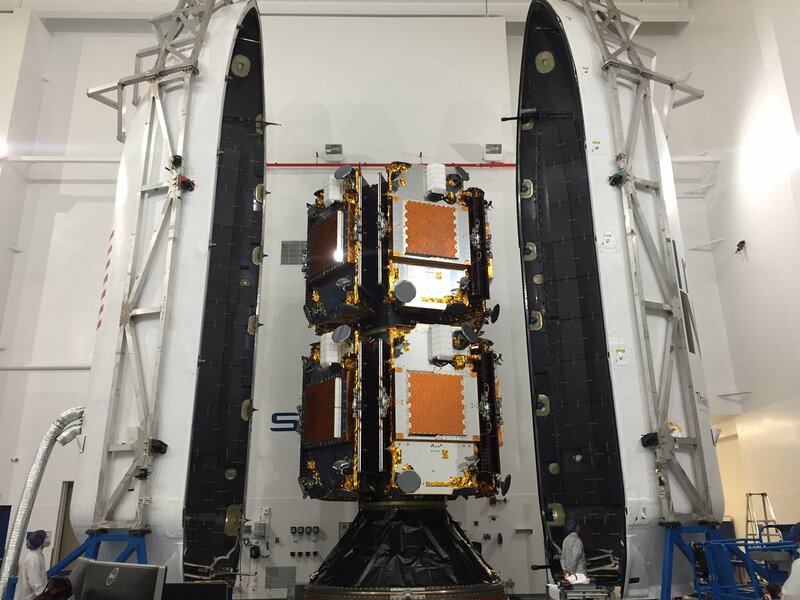 Each Iridium Next satellite has a launch mass of 860 kg with dimensions (3.1 m x 2.4 m x 1.5 m) that are larger than SpaceX (4.0 m x 1.8 m x 1.2 m). The limitation for the number of satellites SpaceX can launch per vehicle is not the cumulative weight of the satellites, that’s easily within the specs of a Falcon 9, it’s the size of the fairing. I’m merely speculating here, but if SpaceX could mate six of their satellites per segment, they might just be able to squeeze 12 into the fairing. A slightly taller fairing might accommodate 18. If SpaceX can only launch 10 satellites per launch, then they’ll need 160 launches to get the initial constellation in orbit. If they could somehow launch 18 per launch, they would need 89 launches, a big difference. With the current SpaceX backlog there’s no doubt they will need all their launches sites firing on all cylinders. But no other private company has four launch pads at their disposal. SpaceX will have the luxury and flexibility to organize it’s launches based on site availability for its three government leased sites and lesser restrictions with its Boca Chica launch facility. Iridium Next satellite in the fairing. Credit: Iridium. It’s going to take some time for SpaceX to build the satellites for its constellation. It also needs to stretch out the costs of building and launching the satellites. In other words, it has time to get the Boca Chica launch site online and increase the cadence of their launches at all their facilities. SpaceQ contacted Elon Musk by email about the Globe and Mail article and he said he had “no idea where this is coming from.” In other words, SpaceX isn’t interested in a Canadian launch facility.